Every page, every line, every word, was her own. And the names on the spines only took them on loan. 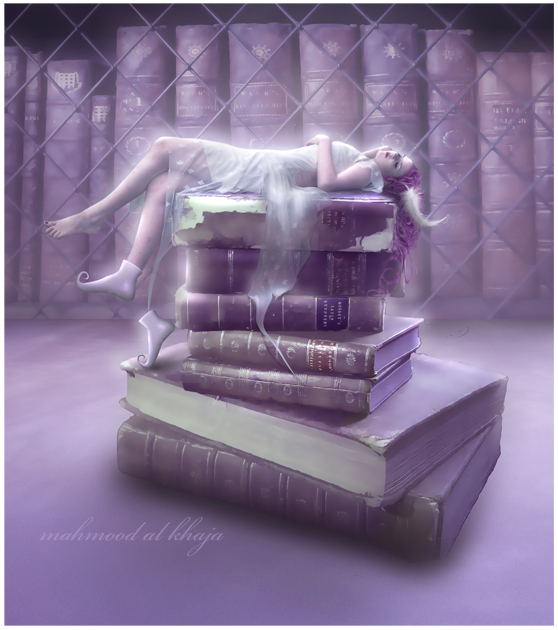 Now she rests on a bed made of beautiful books. As you seldom see elves in a library by day. Putting magic in stories and sparkles in tales. She adds tear drops in buckets and laughter in gales. And they’re written by fairies, like this one you see. PerVirtuous Allan points out to me that l13 is wrong in meter in his accent, I suspect it is in many people’s, in London Library is commonly pronounced Lie-Bree. The image above is a link to deviant art as I do not have permission to copy it. The artst is a man from Bahrain called Mahmood Al Khaja.